Yesterday I saw the first shoots of Tulips and tonight for the first time this spring our neighborhood skunk sprayed around the entire house. He may be the old fellow that would cross my son’s and my yard each evening last year around dusk. But I did see him last night in the bottom of the barn. Today I saw the first of my tomatoes just peaking their leaves above the ground. I am planting more, I planted Roma Tomatoes and some flowers. I still have more seeds to get. 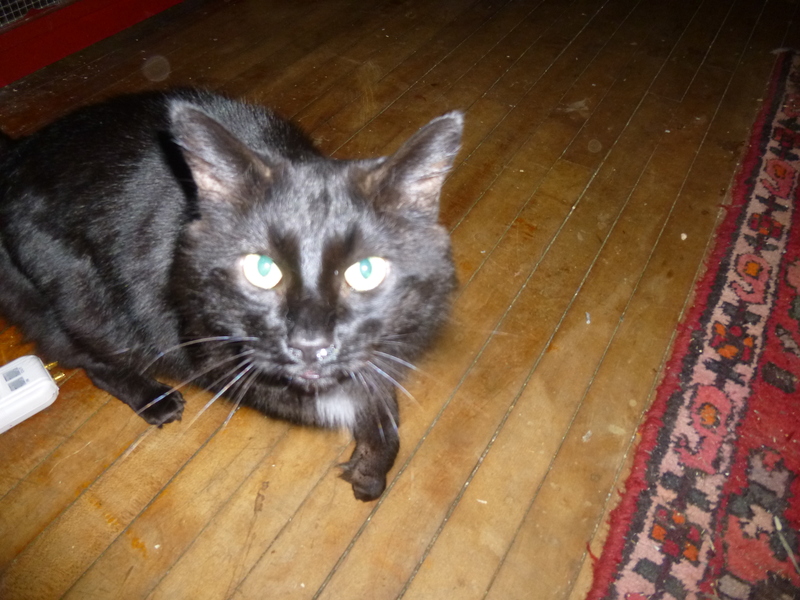 Ollie is improving slowly, he is eating and drinking well in spite of his mouth issues. He is inspiring to me, in the midst of all of this he loves to be petted and purrs. 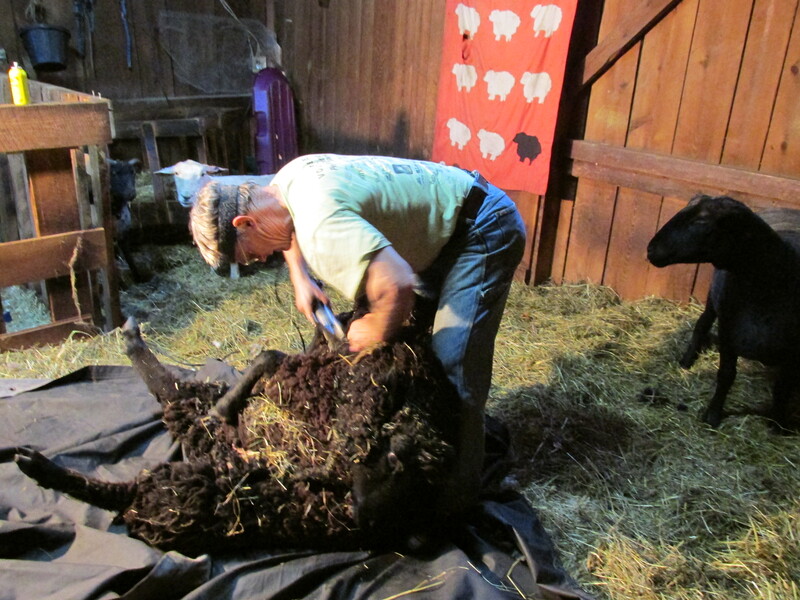 Minnie was exhausted from all the hustle of shearing day. Yesterday the Colrain Fire Department offered a refresher course on CPR. I took my last one 4 years ago. Lots of things have changed. It’s good to keep up with the changes. Yesterday Pine Hill Orchard had their yearly Easter Egg Hunt. The orchard was to wet so they had it near the petting zoo. 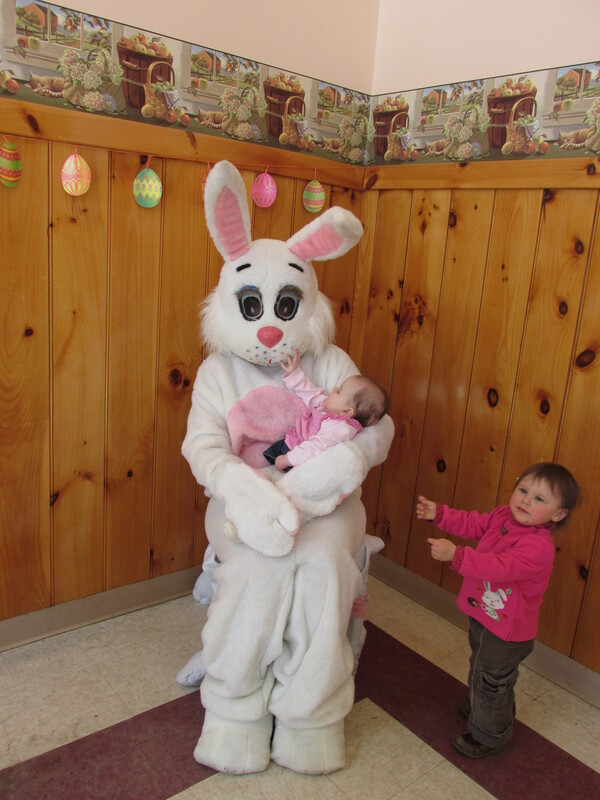 Lil got to meet the Easter Bunny, she quite liked him. I don’t know who the other little girl was but she wanted to be in the picture too! I will start today sorting although I need boxes in which to ship it off in. All the wool is wonderful, but Maudes is especially nice. Oliver has been sick for a few days. It kept getting worse and worse, so yesterday he went to Dr. Funk. He had an infection in the only tooth he had in his mouth and the infection spread to behind his eyes. He had to have some surgery. That boy has been through a lot but still remains cheerful and happy. He came home late afternoon. 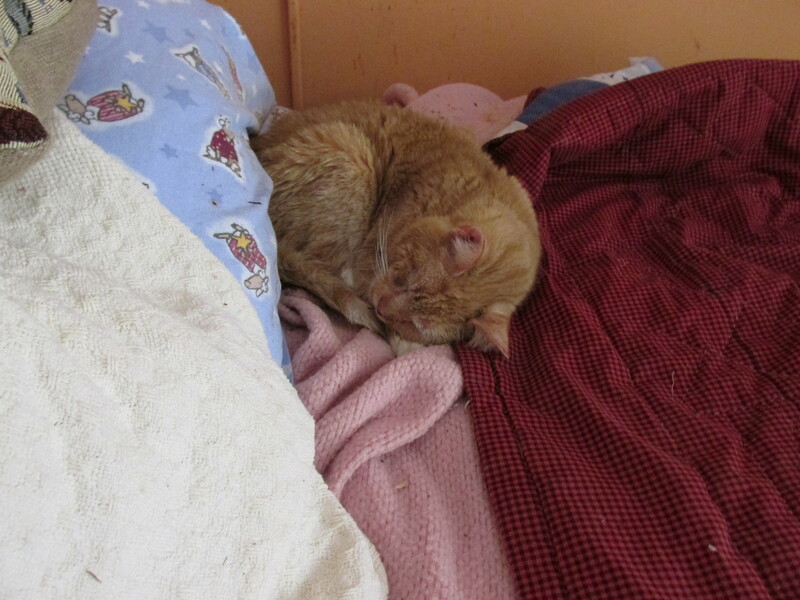 He slept well only awaking once and quickly returning to sleep. Today he ate a little and drank a little. He will return to the doctors next week for a recheck. Although Dr. Funk saw no cancer he couldn’t rule it out. Only time will tell. 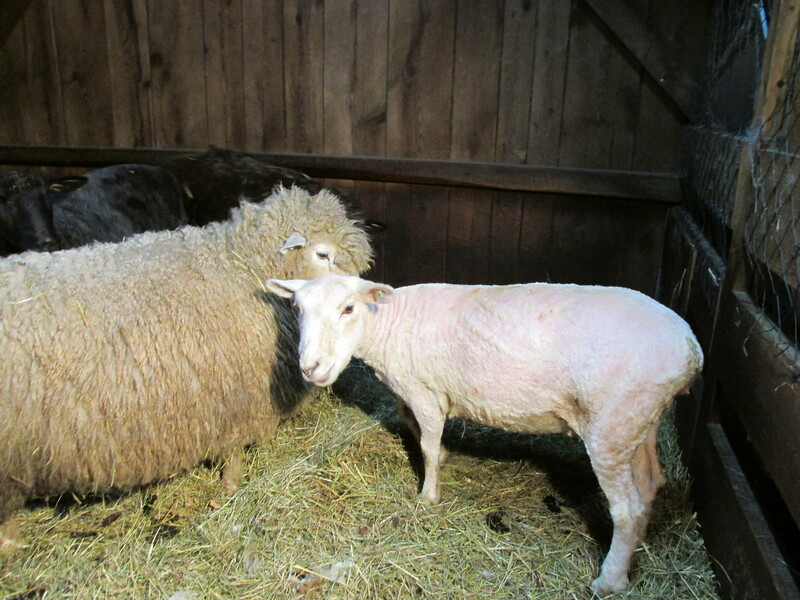 Tomorrow is shearing day. They have been stuck in the barn since yesterday afternoon. Because Steve will be shearing with Electric clippers the sheep need to be really dry to make it easier. 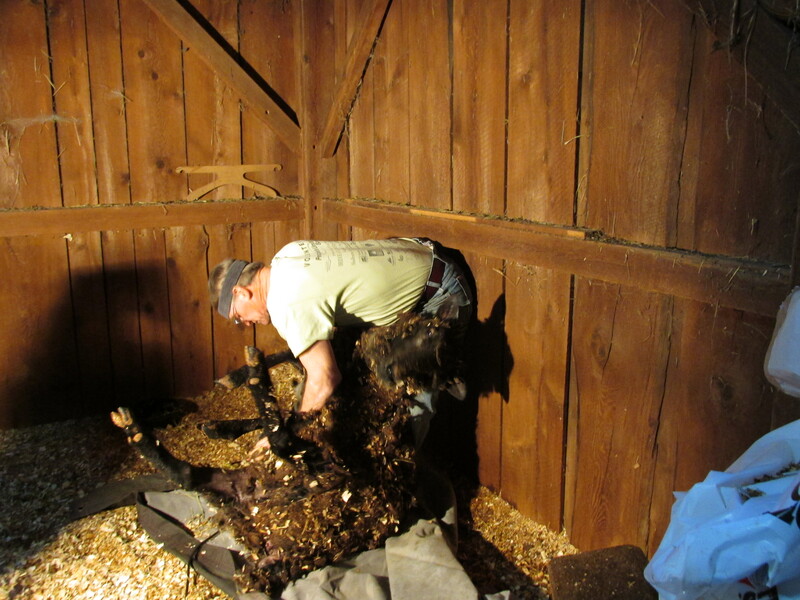 After this chore is done the barn has to be cleaned. Yesterday was a good day for gathering eggs. As you probably have noticed no black spots in the pictures. I got a new camera. A Cannon. (Thanks Anne for the information) I like it a lot, it is easier to manage more hi-tech (but easier to figure out) and I get better pictures. It will take me some time to learn the ins and outs of it but it surely was needed. I bought it at Staples and there were few cameras there. When I asked about that he said cameras have declined in popularity because of phones and Ipads taking pictures. Today I received my favorite plant catalog of all, Andrew’s Greenhouse Plant catalog. I started going to Andrew’s in the late 80’s when they offered pick your own strawberries. I also bought hay from them. They added a greenhouse or two and pick your own raspberries and plants. They offer perennials, roses, herbs bedding plants vegetable plants and much more. This year they are offering some workshops which will be wonderful. The catalog is wonderful, no fancy colored pictures, drawings or any of that stuff, they don’t need it . Each plant has a full description of its habits, where it needs to be planted and on and on. Once a month when I pick up the sheep’s carrots in Amherst I will stop by with a list. I am working on getting my whole yard full of plants. I will get a few more Rugosa Rose plants some perennials and herbs from them to fill in places here and there. Take a look at their website; andrewsgreenhouse.com you will enjoy it. The snow is melting slowly so there is no big flooding in the barn and I am sure most will be gone by the weekend. Minnie has had a big day today walking all over and sleeping on the sofa. She is feeling more comfortable now. Today I worked on the announcement card. I started sending out announcement card when I got the chickens. My friends got such a kick out of it that if I don’t send them I am questioned. Minnie’s is ready to go to Staples to be copied and made into cards. I will post it when they come back. Tonight I have all the grass colors out and plan to finish hooking it. There is not a lot left to do so I should get that finished. The rug is finished and on the wall. I do like how it came out. My hooking tends to be lumpy and bumpy. I like it that way although when I look at other hooking with it all even there are times I wish I could do it like that. My right hand has arthritis and I accept my limitations and go merrily onward. I will be glad to get a new camera!!!!!! I am onto the Lighthouse Rug working on the rest of the lawn and house this week. Next week I will start on the lighthouse itself and then the sky with a few puffins flying about. I am hoping to have this finished before Camp Wool and will take the Blueberry Jar rug with me to work on there. I also want to draw out the rug with my dad on his sled. The kitchen counter is the best place for the seeds to be started. 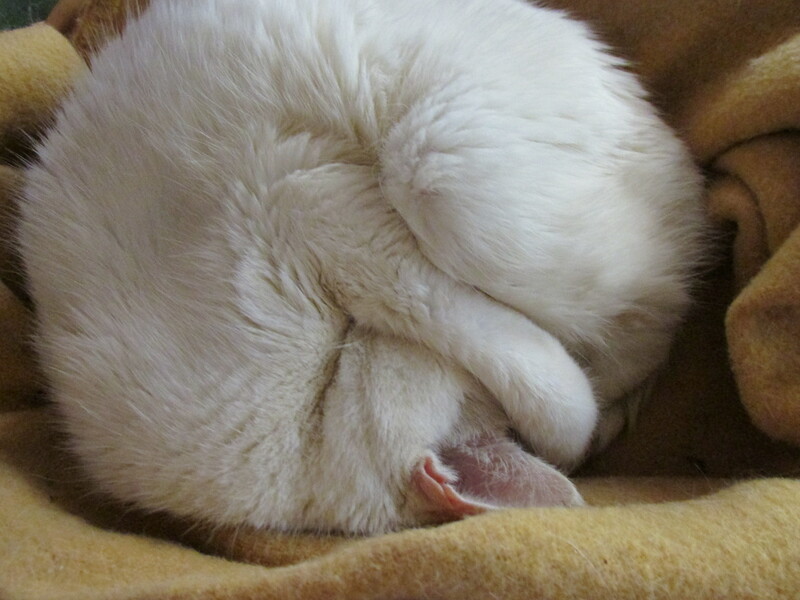 I can have the light on all day and shut it off before I go to bed. Upstairs in the south bedroom would have been perfect but there are mice about and they tend to dig up things and eat the seeds. I can have a watchful eye in the kitchen, and Shorty patrols there frequently. My kitchen is not the normal large county kitchen of the mid 1800’s. I don’t know why. Its seems that it was enlarged sometime, and they used the wood shed . That is the part that I had to have new sills, walls, insulation and flooring last summer. Today I am setting it all up and washing the starter trays and tomorrow I will plant. This gives the plants the right time to be ready to plant in the ground late May without getting too spindly. At least I hope it happens that way. As you can see it’s almost done. It was really a fun rug to hook and easily could have been done with yarn. I plan to finish hooking it tonight and hem it and sew the backing on tomorrow. I found a piece of brown plaid wool, decided to use some of it for a backing, I still had some of the green dye left and I think it will do. Today I took Lil and Lauren to the doctors, Its time for lil’s 4 month check up and assorted shots. The doctor said that Lauren could start her on a small amount of cereal but even though the rice cereal would be best for her to start on studies have shown high traces of arsenic in it so use oatmeal or barley instead. It seems that the rice is now grown on land that cotton was grown on and the rice pulls up the arsenic from the soil. All the things that were done in the past are coming home to roost! Camp Wool is less than a month away. The shop has moved into the town of Kennebunk itself and I am anxious to see it. Rug hooking is very popular now and there is usually a waiting list for the 2 day retreat. A bunch of us usually stay at The Bonnie Doon which is a quaint motel in Ogunquit. I am going up on Thursday and on Friday I will me my childhood friend, Francine for lunch. We will talk the day away. reminisce about our wonderful childhood. I can’t wait. 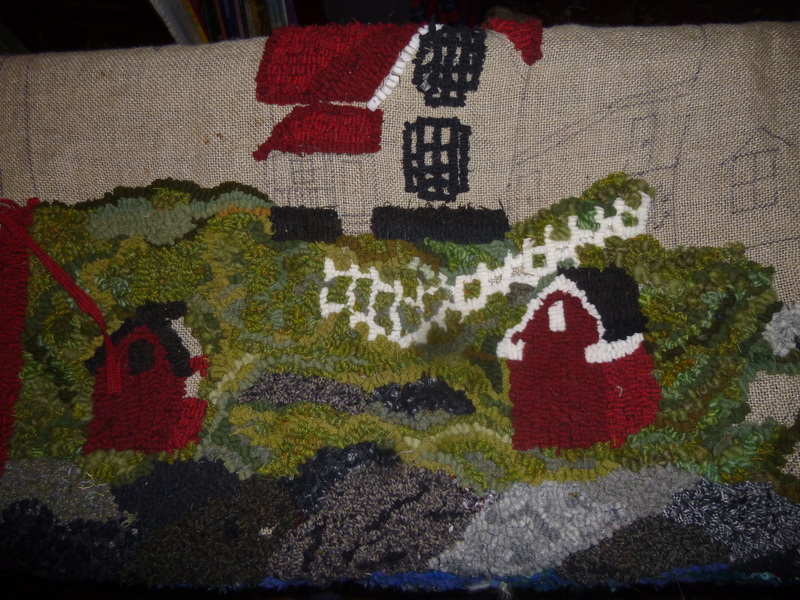 Now I will have to get working on the Nubble Light Rug and finish it. If you are ever in Kennebunk stop in at Camp Wool she has all sorts of woolen items and antiques.